I am training for this half marathon. And y’all, this past week was so hard! I got new shoes that somehow caused me to literally kick myself in the shin constantly when I was running. Then, we ran 9 miles for the first time ever. I ended that day with bruises on my hip and the strict inability to even lift my legs to climb stairs! My dad asked me to climb up and help him hang molding and that was just out of the question! But, it’s a journey. A journey of bumps, bruises, soreness, and trials…but leading toward a wonderful and proud moment at the end. And that, friends, is precisely what the book of Hebrews is! A look at a journey—a longer one, filled with bumps and bruises and battles along the way—but, a journey toward our King Jesus! The teacher in the book gathers his flock and says keep on walking because Jesus is so worth it! We started our first Hebrews Bible Study and I’m super excited about where it is going to lead. My prayer is that we will find the same encouragement that I’ve found in my half marathon training—keep on going because the end is SO WORTH IT! Every Monday morning, I’m going to try and recap our Hebrews discussion and teaching time. I’m not going to go into extravagant detail, but I want it for my records if nothing else! Tonight, we did an intro and history lesson about Hebrews. We learned that Hebrews is all about sprinting toward Jesus! We can really boil down the 13 chapters into two key concepts: the superiority and the accessibility of Jesus. These two things are so juxtaposed! A sweet friend shared the timely idea, though, of the Russian Ice Skater who was just a normal girl…but Putin came to watch her skate. How superior is he to her? She has no access to him, no ability to speak—let alone hug him or talk to him. However; what if she wins gold? What if she perfect scores? Or even a farther stretch, what if Putin decides to adopt this sweet girl? Then, she has the ultimate access. Y’all—that and so much greater is how God is to us! Our superior king came to see us, fell in love, chose us, and adopted us—giving us the ultimate access to his Throne (through his son Jesus!). Hebrews was written between 60 and 70 AD—which is three to four decades after the death and resurrection of Jesus. And we don’t know who wrote Hebrews. We know that the author uses sermonic exhortations and conversational Greek. Basically, what this writing tells us is that this author was a pastor of these people who spoke their language. It was probably preached, transcribed, and then passed around. How cool! Have you ever heard a sermon and passed it along to a friend? I know I have! We do know about the people group it is written to. Hebrews was written to a small group of Jewish Christians, who were living in either Rome or Jerusalem. They clearly did not fit in their culture, which was during the time that Nero was the emperor of Rome. Nero ruled Rome from 54-68 AD and he clearly hated Christians. He hated that they would not bow to him. Nero confused the sacraments. He thought they were literally drinking Christ’s blood and eating his body, so he thought they were cannibals. The straw that broke the camels back—there was a great fire that almost destroyed Rome. Many people think that Nero was the crazy arsonist. His political power was waning and his goal was to come in and “save the day!” The problem was that Nero was blamed…and needed a scapegoat! So, he blamed the Christians. He had soldiers arrest and impale Christians, set them on fire, and entertain himself in this way. These believers were in a society where Christians were clearly hated and persecuted. Its understanding, humanly speaking, that many would question whether they wanted to go the whole way with Jesus. Maybe we should just pretend we aren’t Christians, and go back to the official Jewish culture. But now, the pastor of Hebrews says, but now, in these Last Days he has spoken to us by his son. When is this? It’s now! We are living in that time—so this letter is completely to us, as well! We know that Christ has already come once; He was born, lived and taught on the earth, died, and rose again. We are witnesses to this; but Christ has not come back a second time. So, the same season that the Hebrew people were living in is the season we are living in at this moment. We are in the “Already but Not Yet!” We have already been redeemed, but not yet eternalized. We are in the last days, but we are not there yet. The writer/speaker says, now that we have Christ…why in the world would we go back to trying to understand our dreams and Holy Dice when we have Christ! When we have the exact words of Christ, why would these people go back to being “Jews”? There’s a long long way to go! We are going and we hurt and we are exhausted and we want to stop…so their pastor gathers them and says you have to keep going because you have Jesus. Jesus is everything you will ever need. Keep walking! Jesus loves you. What battle/hill are you climbing right now? What do you hope to get from this study? I encouraged the group to actually write something down for this question so that at the end of the time, we can look back and see how God has moved. I’m excited for this tangible picture of God’s work in our lives. 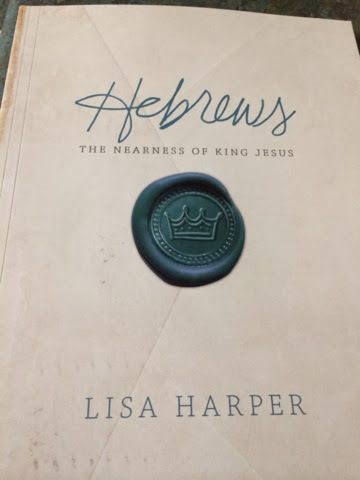 If you haven’t, I would encourage you to buy the workbook Hebrews, by Lisa Harper and study along with us as we do this study. If not, don’t worry—I will only be recapping on Monday mornings and doing “normal” blog things on the other days!